Cupcake, my love: A Trip to Florida for Tuesdays with Dorie! A Trip to Florida for Tuesdays with Dorie! It's my first Tuesday as a TWD member and I couldn't have been more happier with the choice! 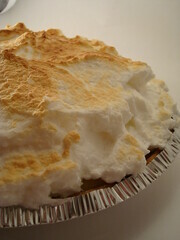 Dianne of Dianne's Dishes was the lucky picker of the week and chose Florida Pie. 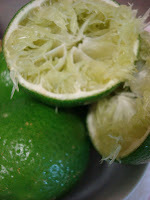 At first, when reading the recipe it sound like it was going to be reminiscent of Key Lime Pie, but with a hint of coconut, and I must say I was wrong. 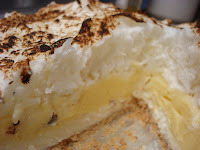 While the pie does have a lime cream center, the most amazing, and my most favorite, part of the pie was the coconut cream base. I reminded me a lot, which is also Dorie's description, of the filling in an Almond Joy or Mounds candy bar...can you say YUM! Seeing as how I am still adjusting to my new apartment I have not yet been able to invest in a food processor (hopefully next week) so I used a store bought graham cracker pie crust. I was surprised at how quickly this pie comes together and how quickly it made me want to get in my bathing suit and eat it while lounging in a beach chair. Some people really believe that food can take you places, and I am one of those people. 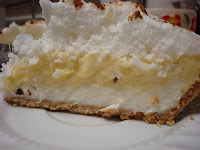 A few years ago I went to Jamaica, and this pie totally took me back! Back to the smoldering, sweaty heat, but the refreshing taste of something like Florida Pie quickly cooling down your body. I hear the little Jamaican girls surrounding me in the shallow, lapping waves, asking me why my hair is so different than theirs. Following me around the beach just in awe of my nationality and differences. When food can give you that kind of feeling, you know it's a keeper. I can't wait to share this pie with my family and see where it takes them! your pie looks great! 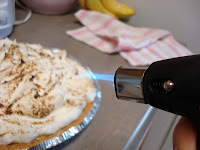 love that you got to use the blowtorch, i don't have one yet but i bet it's fun! Your pie looks great! Welcome to TWD! you pie looks wonderful! you did such a great job. Totally agree that food can take you back. Blow torching looks fun! Great job! love your fab looking pie, welcome to TWD..!! it's my second week. hehee. But anyway, yours looks great! Looks great. Way to bust out the blow torch. A blowtorch! I need one of those (fire and a tool and wooo!) Hmmm... D'ya think I could make toasted marshmallows with that? Loved the coconut cream, too! Isn't it fun to play with fire? 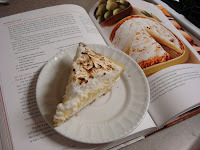 Nice job on the pie - and really nice post. I agree about food taking you places. Though if I were to put on a bathing suit and lounge outside in a beach chair while eating it...the fashion police would be stopping by to grab the pie and throw a tarp over me. Welcome to TWD!